There are so many bands out there today that it’s impossible to listen to them all, let alone enjoy them. Autumn’s Grey Solace is definitely a band to enjoy as well as adore. Their music speaks for itself so there’s not much I could say that their songs can’t say better. Scott Ferrell’s musicianship along with Erin Welton’s crystal clear vocals blend together to create a hybrid of shoegazing melodies textured with ethereal soundscapes. Truly an incredible band. Scott was kind enough to talk to me about the band so here it is. Enjoy. Rob- So first off, how are you today? Rob- Great…Can you introduce yourself to the reader? Scott- I’m Scott Ferrell. 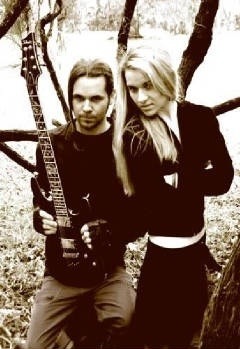 Along with my partner, vocalist and lyricist Erin Welton, I compose and perform almost all of the music for the ethereal/shoegaze/dreampop band, Autumn’s Grey Solace. Rob- Now the band was formed in 2000. At what point did you know that the two of you would be a perfect match musically? Scott- In the late 90s I was composing various musical pieces. When Erin wrote the vocal melody and lyrics to the first song, I knew her voice complimented the music perfectly. Rob- Have either of you performed in other bands prior to this one? Scott- Just me. I have been in several bands but I could never find musicians who had the same musical goals that I had. When I discovered the freedom of multitrack recording, I could take my musical visions to a new level, without the limitations of what could be done with a live band. Rob- In my opinion, Erin has got one of the most beautiful and powerful voices in music. Has she ever received any formal vocal training in the past to achieve such intense levels in her singing? Scott- Erin is completely self-trained. She used a keyboard to help develop her voice. Rob- Now, you perform every instrument on the albums. Guitars, Bass, Drums, Mandolin, etc… How did you come to be such a musical mastermind and how long did it take you to learn all of those instruments? Scott- I started playing guitar when I was 14. I gradually progressed to all of the other instruments over a period of a few years. I was very introverted, and I spent a lot of time in isolation practicing and creating. to play live and do you have a favorite to record with? strings, which allows me to obtain unique chord voicings. Other times I have favored a baritone guitar and a 7-string guitar. Rob- Now in 2000, you began work on what was to become your debut album “Within The Depths of a Darkened Forest”. Was it a difficult task to get comfortable with the recording process or have you had previous experience in a studio? Scott- In the late 90s I was obsessed with learning to record. I researched and practiced recording for a couple of years before we started working on “Within The Depths Of A Darkened Forest”. So I was comfortable with the recording process when we created that first album. Rob- How long did it take to complete that album? Rob- Now since then, the two of you have been churning out album after album. In 2004, “Over The Ocean” was released and in 2005, “Riverine” came out. Now you are gearing up for a new album in September. How do you manage to release so many albums so quickly and still maintain that incredible production and quality in the recordings? energy into working on the music and dedicating the time needed to complete each project. Rob- Which album would you say was the easiest to record and which had its most challenges? And why? Scott- “Riverine” was the easiest to record because we had a very solid connection between what we were trying to express and it was coming out very easily into the music. The new album was the most challenging because it was very experimental, which creates unfamiliar obstacles. Scott- The new album is called “Shades Of Grey”. It does have the ethereal qualities that our previous albums are known for, but this album takes our sound in a lot of new directions. Rob- That’s awesome, I can’t wait to hear it. Have you and Erin ever considered adding additional musicians to the lineup in the future? Scott- We have considered it, but only for a potential live band. about recording an entire holiday album someday? Scott- We enjoyed recording the holiday song, so we would consider recording an entire holiday album someday. Rob- That would be an incredible album if you did. Are the two of you working on any additional projects at the moment? Scott- No, we only have time for Autumn’s Grey Solace. Rob- Will you be out touring to promote this new album? Scott- Probably not, but this could change. Rob- Before we say good-bye, did you enjoy our interview? Scott- Yes, thank you Rob. This entry was posted in interview, Music and tagged Autumn's Grey Solace, Erin Whelton, Ocean View Press, Rob Watts, Scott and Erin. Bookmark the permalink.